Mission #34, 30 March 1945, to Bremen, Germany in PFF B-17G #44-8484 (No name) (358 BS) VK-W, piloted by Capt Hugh B. Johnson. B-17 was hit by flak over Bremen and sustained a hole in the right wing and #3 and #4 gas tanks. Gas poured out from the hole and across the #3 supercharger. The #3 engine was feathered and the B-17 began to drop back, The deputy leader was instructed to take over the lead. #44-8484 slid back and down through the formation, started off toward the right for a while, and then came back behind and below the formation. The B-17 made a crash landing in a wheat field on the east bank of the Rhine River. All ten crewmen were uninjured, but were immediately captured by German troops and transported to POW camps. 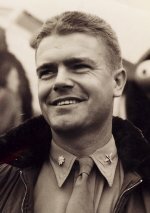 Major Glynn F. Shumake (P) - Graduated as a 27 year old 2nd Lt from Advanced Pilot school on 12 December 1941. Was Assigned to the 358th BS at Gowen Field, Boise, Idaho in 4 March 1942 and was appointed as the 358th BS Assistant Engineering Officer and later as Engineering Officer. Was appointed as the 358th Operations Officer on 26 June 1942 and arrived at Molesworth as a member of the original contingent. Became the 303rd BG(H) Operations Officer in August 1943, was promoted to Major on 27 September 1943. Became the 358th BS Commanding Officer on 12 January 1945. Flew 31 of his 35 credited missions as a Lead Crew Pilot and Air Commander. Most of his missions were flown in the left seat as CoPilot with senior Officers as the Lead Crew Pilot Completed his first combat tour as a Lead Crewman on 23 September 1944 and promptly volunteered for a second combat tour. Retired from the USAF as a Colonel in May 1975.